✿【Material】Make from food grade silicone, 100% BPA FREE, approved by FDA, CE. Silicone antisepsis safety and non-toxic. ✿【Perfect gift】Moms can wear this set like bling or jewelry. Available in different colors, they can be matched to your outfit. Better than baltic amber and great alternative to teether toys and animals like Sophie the giraffe, teething bibs, pacifier, blanket, towel, books, ring, keys or toothbrush. This set is a smart addition to your registry or great baby shower gifts. ✿【User-friendly】 Teething necklace with a splittable clasp easy to wear and take off,easy to clean and preserve. 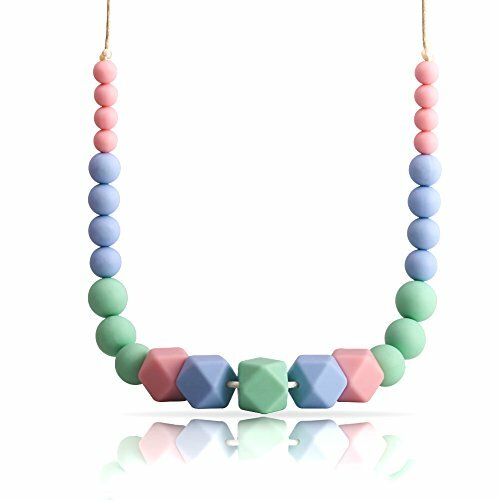 ✿【Warranty】For any reason, If our Silicone teething necklace have any quality issues or your little one doesn\'t like this product, send us a friendly message first and we will immediately issue you a full refund. We love to serve you and we care about your thoughts. ✿【Application】Baby teething necklace use for baby teething, relieve baby teething pain, pacify baby cry and scream, make healthy development of the baby\'s teeth.We aim to design baby product that will not only add fun between moms and babies but also strengthen moms\' beauty,The BPA free beads are made from the same material that bottles and dummies are made from, so they are safe and fun for your little one to chomp away on whilst serving as a stylish fashion accessory for Mumma!